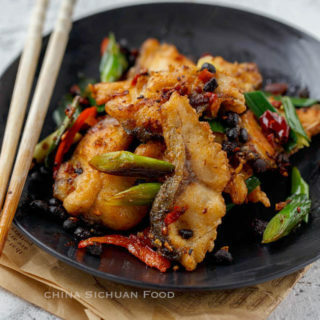 Crisp pan-fried fish with a popular Szechuan twice flavoring method. 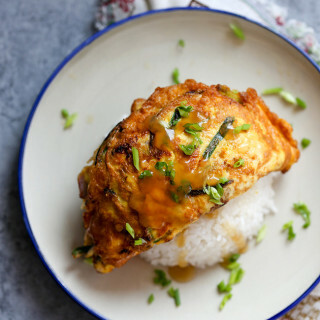 I have received this recipe request previously and I am so excited and happy to know that someone in my readers have tested this dish. 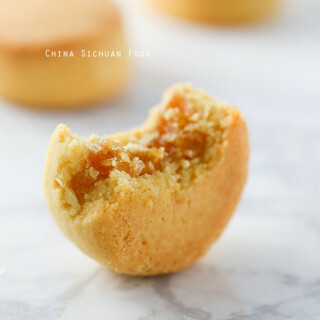 It is not famous even outside Sichuan area. But it is a brilliant dish. 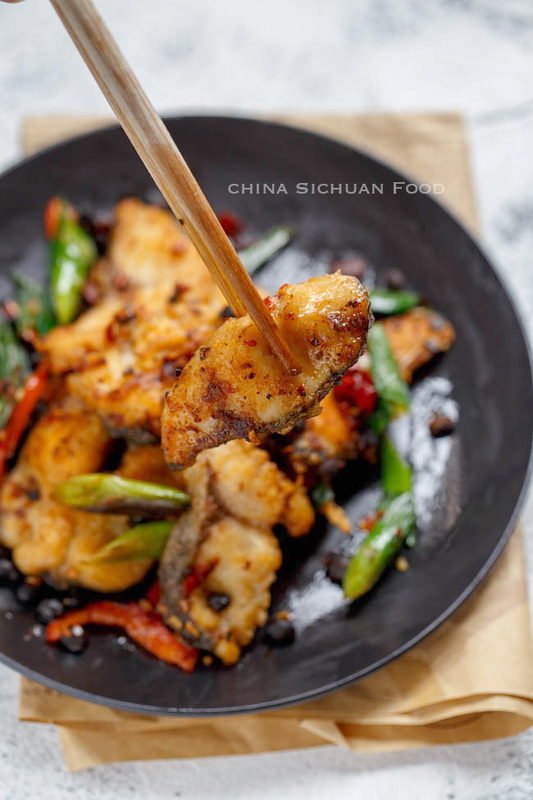 The method twice cooking comes from a classic Szechuan style double cooked or twice cooked pork belly “回锅肉”. 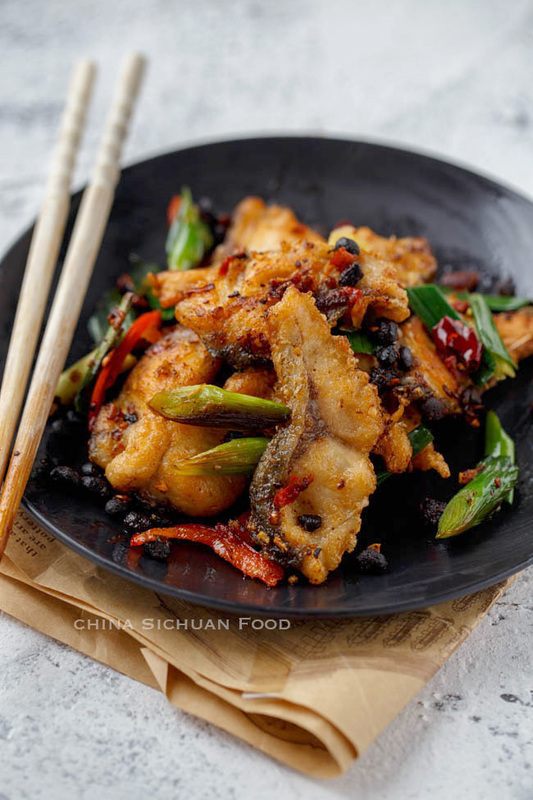 In that dish, the pork belly is firstly cooked in water with some common ingredients and then re-cooked with Sichuan peppercorn, doubanjiang and other seasonings. 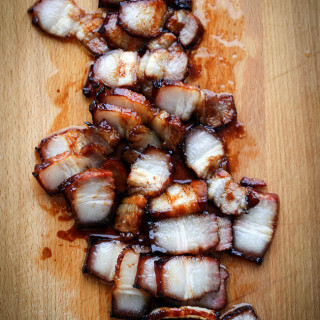 Well cooked pork belly slices can absorb the taste from seasonings and create yummy taste with the help of the fat meat. Fish has different attributes from pork. 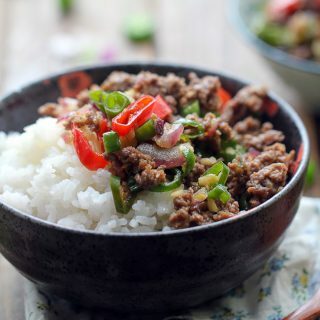 It can be cooked within a very short time and may break easily. So the first time cooking should be different too. 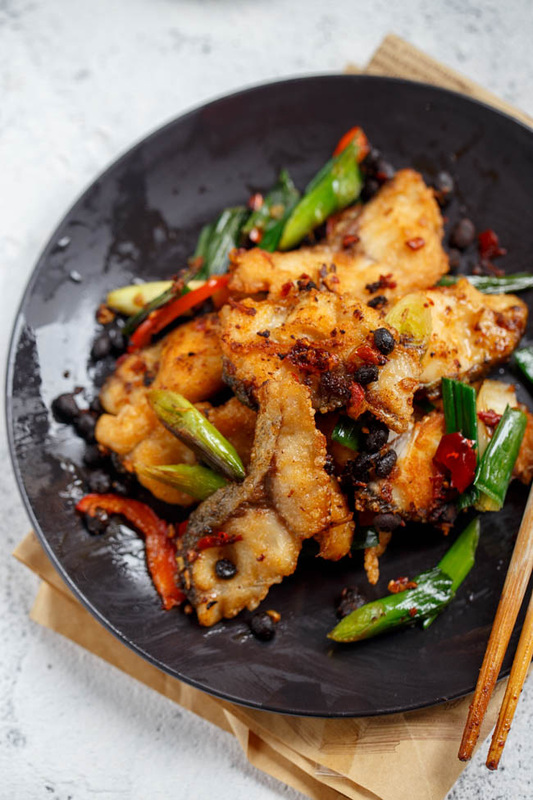 There are two ways of treating the fish before stir-frying. One is deep-frying and the other is shallow frying. 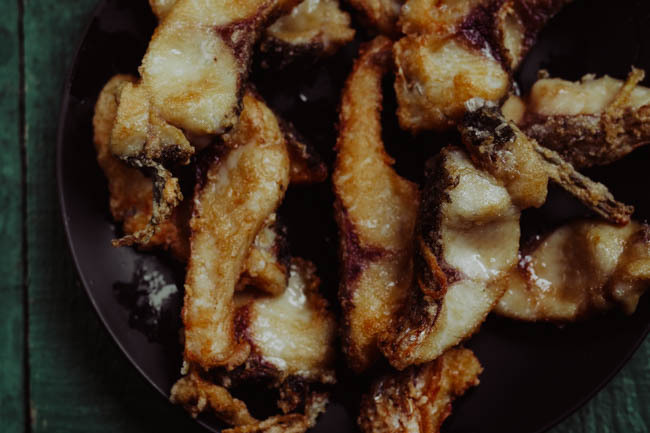 Deep-frying gives the fish pieces a very thick shell, which will further take the responsibility of taking the flavors in and keep the fish meat as tender as possible. This method is more popular in restaurants. 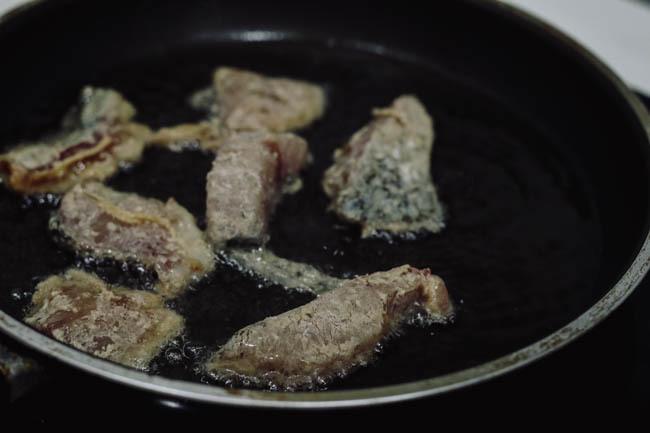 However, shallow frying creates only a thin layer of skins, which allows the taste go inside. This one is more home cooking friendly. So I introduce shallow frying process this time. 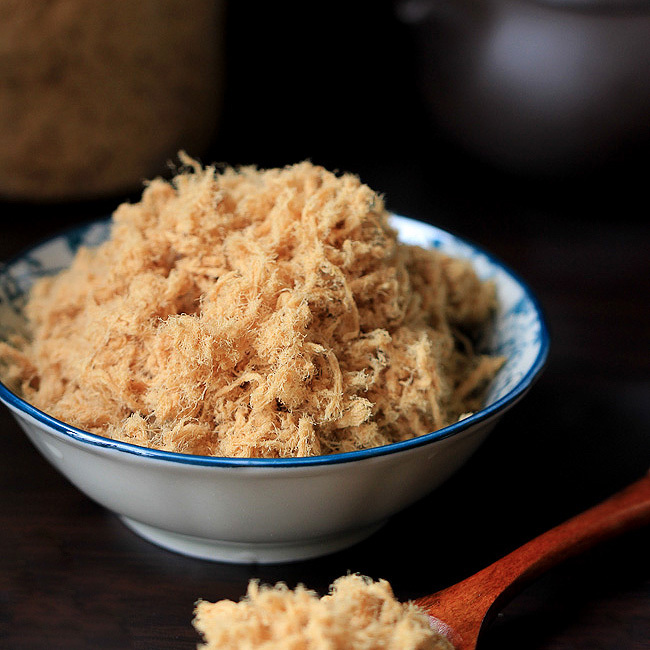 Coating each piece of fish meat with starch might be quite time consuming and evening coating need higher skills. 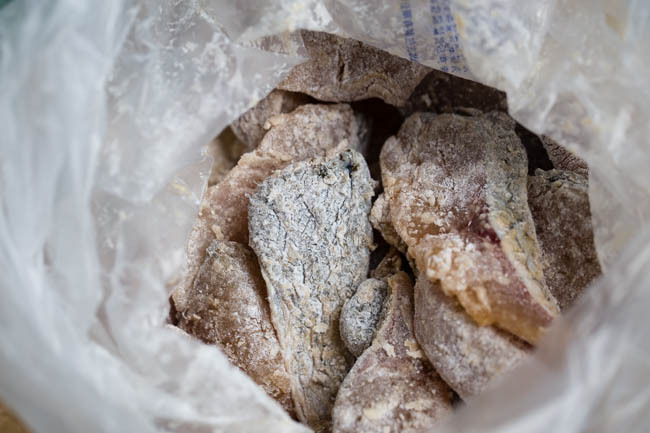 You can transfer the fish meat in a plastic bag and then slightly shake with starch. 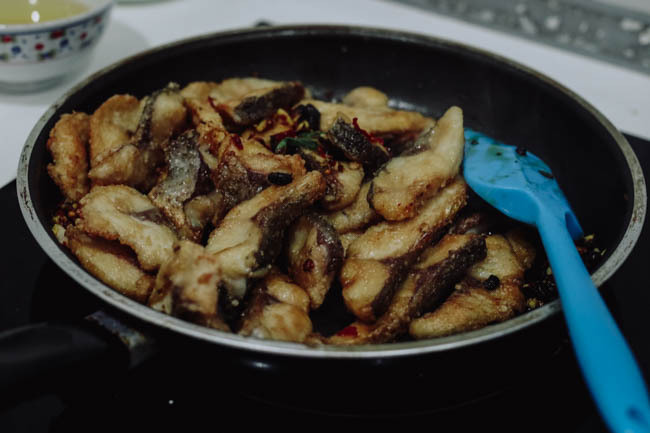 When well coated, let the fish pieces stand for 5- 10 minutes so the starch can absorb the water and become sticky, otherwise it escapes during any movement in the shallow frying process. Cut the fish into pieces around 2cm thick. Add cooking wine, ginger shreds, soy sauce, salt and sugar and massage for 1 minutes. Set aside and marinade for 10 minutes. Add 1/4 cup of cornstarch in a bag and place the fish fillet in. Slightly shake until every piece of fish is well coated with the cornstarch. Then stand for 5-10 minutes. 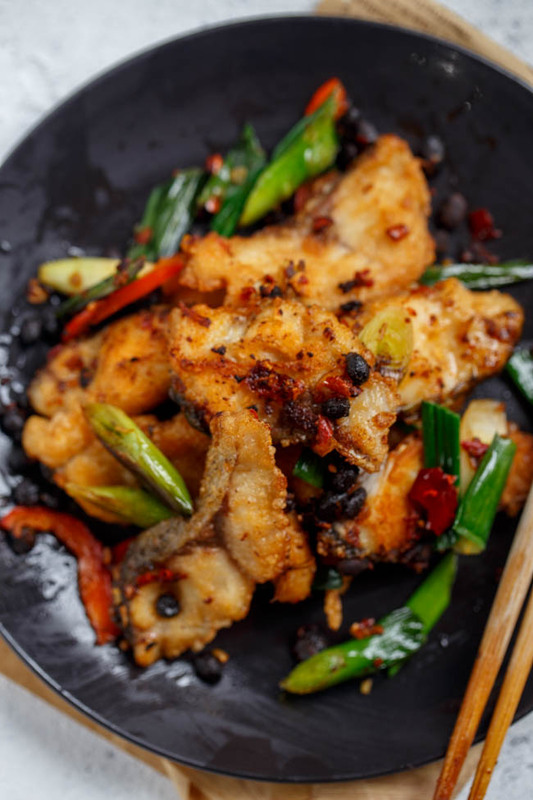 Prepare a shallow pan and add 1/4 cup of oil and shallow fry the fish pieces until hardened and golden brown on surface. Transfer out. 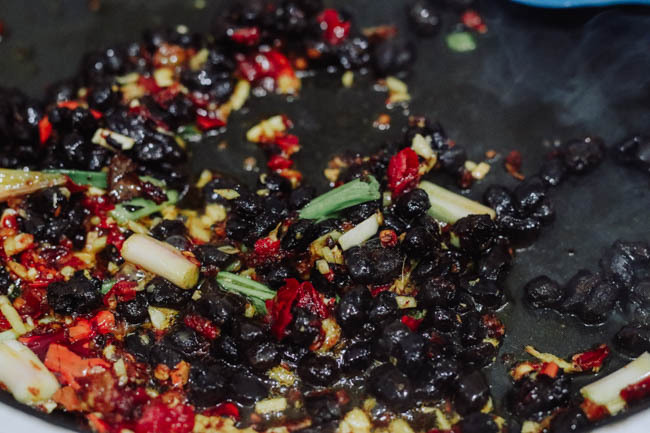 Leave around 1 tablespoon of oil in the pan, slow down the fire and fry doubanjiang for 1 minutes until the red turns red. Add garlic, ginger and dou-chi and fry until aromatic. Place chili peppers, scallion sections and garlic sprouts in. Fry until almost soft and return the fish, add light soy sauce and salt. Mix well. Serve immediately. This is great! 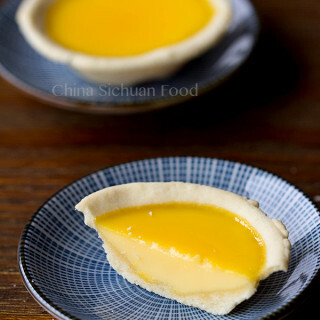 My favorite recipes are those which are lesser known, and not often posted in English — since I can’t read Chinese, it’s wonderful to see you post a more regional recipe. Thank you for all of your hard work! Great recipe. We make it often! what is snack headfish? 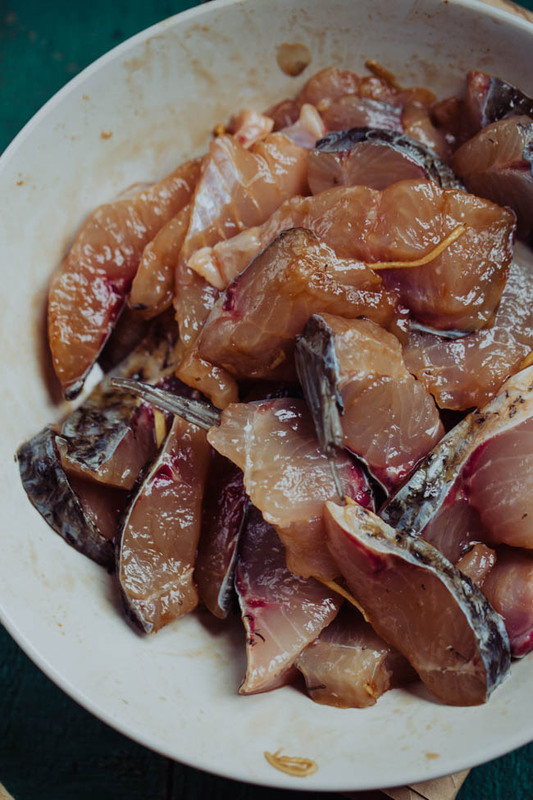 This is great with bluefish or even mackerel. But with loster it is divine! Thanks for your feedback. That’s a typo. It should be snakehead, a very popular fresh water fish. A few questions. You don’t list the garlic sprouts in the recipe. How much do you use and how do you prepare them? 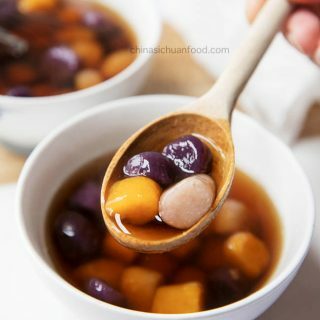 The amount of dou-chi in the photo where you are doing the cooking looks like a lot more than 1 Tbsp. I don’t see any green chili peppers in the photos. Did you leave them out? Usually 2-3 garlic sprouts are enough. It is just side ingredients. I simply cut it into small sections. 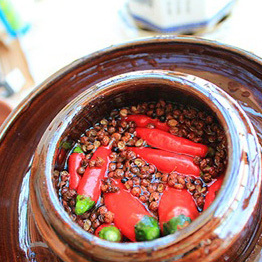 For the peppers, I use red pepper mainly as a color supplement, so green ones must be skipped. Thanks for the correctness. Je suis de l’avis de Richard. C’est un plaisir de découvrir des recettes régionales et surtout de famille. It is so pleasant to read such a nice comment. 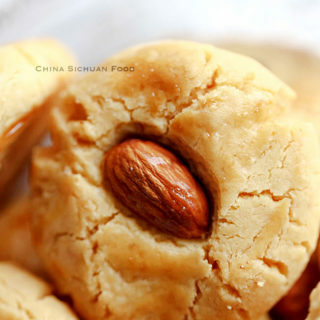 Happy cooking and I hope you can make more yummy Chinese dishes in your kitchen with me. Dear freinds, Always I appreciate this lovely and magnificent help to improve my chance to enjoy my life through eat well. 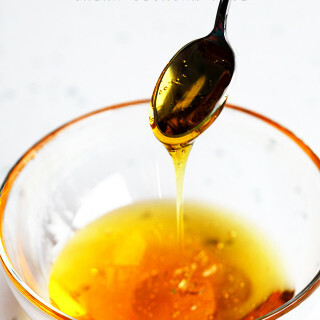 This is an amazing and so simple reciipe that I will enjoy how correspond: in small quantity many times a year. The gods belss you. Herman, from Leticia in the Colombian Amazon area. Elaine how much grams is 1 whole snakehead fillet? Wow, it actually depends on how large the fish is. But I use around 600g in this recipe. Nice catch! I will update this in the recipe.